This photo is oddly one of my favorites from my visit to Kenya. 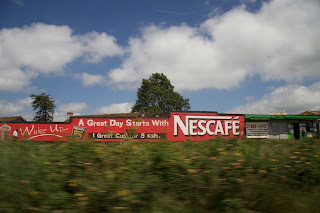 I took it from the back seat of the car heading back to Nairobi after three nights at Carnelly's on Lake Naivasha. The imagery along the road was stimulating, beautiful, colorful and at times over run with garbage and make shift structures. Kenya is a country of contrasts—clean and orderly, yet laden with trash; colorfully painted buildings next to darkened shacks; white kenyan economy vs. the native kenyan economy. I am still absorbing the sights, sounds, smells and interactions of my three weeks in Kenya, more photos over time.